I did it. I ordered Sailors on the Starless Sea, The People of the Pit, and the Emerald Enchanter. They do love some alliteration over at Goodman Games, but that’s in-line with the old-school feel of the system. I’ve read through all of them at this point and I can say they are worth every penny. Weighing in at 16 pages, at first glance they don’t appear terribly long for being $10 a pop. My concerns quickly evaporated once I got in to reading the adventures and flipping back and forth from the text to Doug Kovacs incredible maps and illustrations. These adventures are dark, deadly, and deep (Sorry, I got in to the alliterative spirit there!) and will provide hours of awesome gritty adventure for the Skyland Games crew. The pirates are on a bit of a hiatus since one of the crew got called out of state for a few weeks, so we should be able to find the time to get in to at least one of these. Now the problem is choosing which one! I won’t provide any kind of spoilers on here about the adventures themselves, but just like Pathfinder Society mods, the cover is a big clue to what will be going on in the module. Each one has a very cool concept, and I think I’ll be adding the others to my collection. It looks like Jewel of the Carnifex is out now and appears to be a 24 page module for the same price! After seeing what they can do with 16 pages, I imagine the 24 pages will be chock full of deadly, awesome material. In fact, it looks like all the forthcoming higher level adventures will be at the 24 page count rather than 16. The modules also have awesome black and white art throughout, just as the main core rulebook does. I know some DMs don’t approve of pre-written content, thinking that the best adventure comes from your own imagination. I’m all for that, but I don’t mind borrowing the imaginations of Harley Stroh and Joseph Goodman from time to time; especially when the adventures are as awesome as these! My one criticism is that they don’t provide a lot of context or adventure hooks at the beginning, particularly in Sailors of the Starless Sea, and they don’t link together very smoothly. That’s OK though, I’d much rather have new spells, items, and creatures. I’ll handle the segues between sessions. Keep up the great work, Goodman Games! You certainly have this game master hooked! Books for Gary, DCCRPG sells out! The first edition AD&D reprints are out, and I picked a set up for myself. It benefits the Gary Gygax Memorial fund, and I hope they do very well. I completely understand the perspective of those who are less than thrilled by the idea, but to me, I think its a really nice gesture and I never owned the originals but love looking back at the roots of the game. A few guys and I were pouring over them in our Friendly Local Gaming Store, and had a great time comparing sketches in the monster manual of iconic creatures that we’ve all come to know and love to their drawings in the original Monster Manual. Some of them are really cool black and white sketches, some look like the rejected doodles of a 7th grader, but that just adds to the charm! Something you can’t tell from the pictures online is the darker areas on the cover are actually raised, giving them a leather-bound classy feel, without actually being truly leather-bound. The pages are also gilded on the edges, which I think is a nice touch. Am I going to actually play 1e AD&D? Probably not anytime soon. For me, these are more reference or inspiration for when it’s time to write an adventure. Also, it’s for Gary and the thousands he has inspired in helping create a hobby where the only limit is your imagination. In other news, it looks like WotC is reprinting 3.5 books. This seems like a bit of a surprising move, and we even joked in the store that anyone who wants to play 3.5 is probably playing Pathfinder by now, but maybe not. Now maybe those numbers are skewed by the fact that there is very little 3.5e stuff in print, so people wanting that stuff have to go searching the interwebs, but those numbers are pretty staggering. 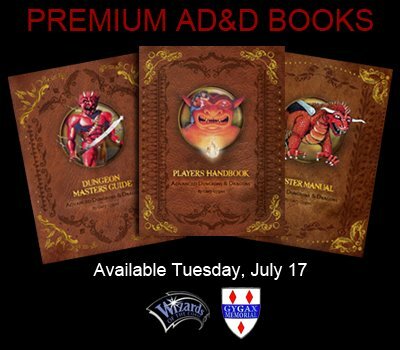 I don’t know that I will pick up that edition, as Pathfinder is enough to keep up with, and they are just different enough to confuse the heck out of this gamer. Also of note, the first printing of DCCRPG has sold out! There are a few things that need correcting that will be taken care of in the second printing, and there will also be a new and different limited-edition cover! In fact, it seems gold-foil limited-edition covers are all the rage over at Goodman Games! Especially cool is the third printing of the Dungeon Alphabet! If you’re one of those “Modules? We don’t need no stinkin’ modules!” kind of GMs, this book is for you. I’ve mentioned it previously in my dungeon building resources articles and my review of the Fourthcore Alphabet (a product in a similar vein). If you love old school dungeons and page after page of awesome black and white art, this is a must-own. Another very cool thing Goodman Games has going on is their Mystery Map Contest! 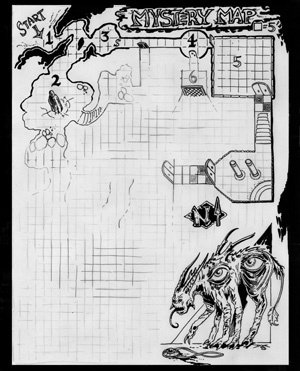 Essentially the contest is to write an adventure using the map and the demon in the corner to create the best adventure possible! You get to fill in the details beyond the few that are already provided, and you must incorporate the weird creature in the bottom-right corner. The winner gets $1000 and becomes the Free RPG Day 2013 offering from Goodman Games! Get your submission in before Halloween! I think the Skyland Games guys will need to try their luck at this. If you enter, good luck! This is what I’ve been reading recently. While it may not be some underground guide to awesome books, if you haven’t heard of these they are worth checking out. 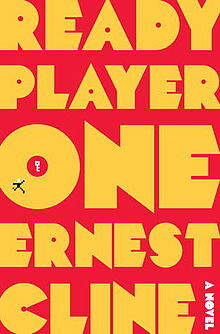 First up, Ready Player One, by Ernest Cline. This book is basically a love letter to the 80s, but presented in a very compelling way. Essentially, a reclusive billionaire video game designer has no living heir, so when he dies, his will reveals a contest that challenges players to find clues in the virtual world upon which he built his empire. Who ever decodes all the clues and beats the game first, inherits the empire. For years very little progresses was made, until one dedicated player final captured the first key. The story follows the journey of Wade Watts, as he works to unravel the clues and be the first to unlock all the keys and gates before the evil corporation IOI can. Throughout the book their are references to 80s movies, music, video games, and even D&D. At one point, Wade has his computer programmed to interact with him like Max Headroom, while flying a DeLorean, wielding a lightsaber, and wearing a ring of protection. It’s basically a geek-splosion. It makes for a very nostalgic, entertaining and exciting read! Next, the Kingkiller Chronicle by Patrick Rothfuss. The first book in this series, The Name of the Wind, has been out since 2007, but if you haven’t read it yet, it’s well worth your time. Rothfuss combines traditional fantasy tropes of magic and coming of age with his own page-turning writing style and richly detailed world. It follows the story of Kvothe, from the perspective of the main character relating his tale to a scribe. Most of the book takes place in the past with occasional interludes in the present. Rothfuss has a very interesting magic system, and magic school, but this is no Harry Potter. This tale is decidedly darker and more varied than ‘boy goes to wizard school.’ I’ve read the second book, The Wise Man’s Fear, and I can’t wait for the third one to be released! Not to be missed if you enjoy a good fantasy book. Lastly, and perhaps most predictably, George R.R. Martin’s Song of Ice and Fire. If you haven’t heard, Game of Thrones is kind of a big deal. I’ve really been enjoying the TV series, and readily admit I had not heard of the books before the show. I would recommend watching the show first before reading the book (always a good idea) particularly for this show however, as they faithfully try to hit all the high points of the story, they have to gloss over some things. 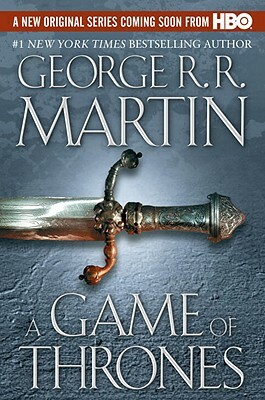 In reading the book afterwards, it fills in all the details and back stories for minor characters and locations, and brings the world of Westeros alive. I’ve been trying to pace myself with these, as the 3rd season of the show is still in production, and George just recently released the 5th book out of 7. Some long time fans had been waiting years for that 5th book, and it is clear he is an author that will not be rushed. I really enjoy the world he has created with its varied characters and detailed heraldry. 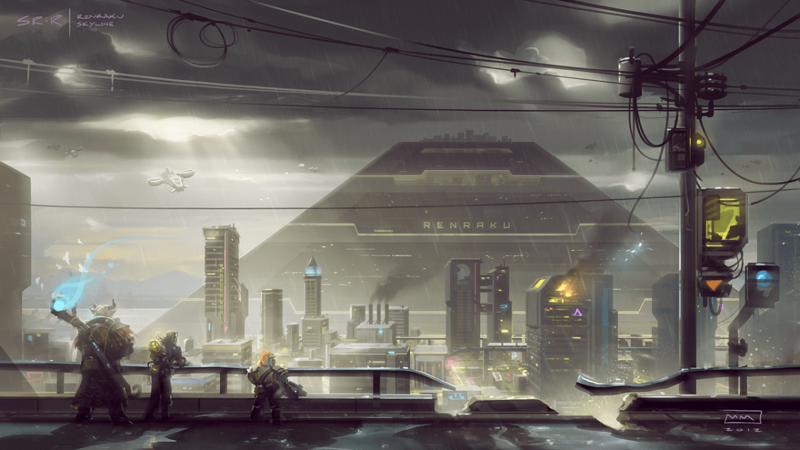 Take a look at this awesome art from the Shadowrun Video Game Kickstarter!!!! A few of us here at Skyland Games who are fans of Shadowrun have talked about how Shadowrun can be a little tough to get into. As long time gamers we’re fed a healthy diet of regular Tolkienesque fantasy themes, but Cybernetic Trolls? Dwarf Fixers? Ork Hackers? That’s a little harder to get into the mind’s eye, and even harder to leap into as a charcter. Part of that problem is that we don’t have a large body of fiction or art to paint us a picture. Now, sure, Shadowrun has just celebrated it’s 20th Annivserary with a new edition of the game, but consistent and good mood art is hard to find. And while a great body of fiction exists out there based on the genre, the game is changing (especially with this most recent edition) and it’s hard to stay up to date. More problematic perhaps is the well developed and detailed history in Shadowrun that requires a fair bit of study to appreciate the richness of the world. Add in even newer and more innovative Augmented Realty rules which shake up the traditions of Shadowrun, and it’s tough to get a handle on. Tack on Technomancers, sprites, and constantly evolving tech, and the game iteslf can be forbidding. Just hard to jump into without more emersion. Ergo, these pics really kind of help me get into the world. Take a look, and shoot us a few links to your favorite game related art!!! As much as we love Wyvern’s Tale and the Asheville gaming scene, sometimes we at Skyland Games just want to broaden our horizons and check out what is going on in nearby areas. Since some of us at Skyland Games live fairly close to Greenville, South Carolina, I decided to go exploring and find out what they had to offer. First off, I found Borderlands, a comic book and game shop on Laurens Road. When I pulled up to the store it did not look like much, but as soon as I went inside it opened up into a large space. On the right was an impressive selection of comic books, graphic novels and other comic related loot. On the left was a gaming section filled with RPGs and an enormous amount of war gaming and tabletop miniatures. They also had a good amount of readily available and easily accessible gaming space in the rear of the store. But a good inventory and space for gaming was only part of what I was searching for. I also looked for excellent customer service which Borderlands definitely had. The staff was friendly, talkative and knew their inventory. The other thing that impressed me was that the staff knew their customers, quite a few by name. That let me know that they care about what they were doing and not the customer’s dollar. Next, I visited Boardwalk near Haywood Mall. From what I understood was that they used to actually be inside the mall and moved to this more easily accessible space. This was a much smaller store packed with board games, dice games, card games and RPGs. There were games for every type of genre (sometimes two) and if you could not find a game there, you simply were not looking hard enough. They had several tables in the rear of the store that would be good for smaller games, but would not be able to accommodate large numbers of gamers at one time. All in all from what I have seen from Borderlands and Boardwalk is that I highly recommend them both. It is always refreshing to find well stocked stores with friendly customer service and let them know I’ll be back soon. 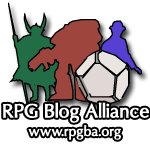 As fans of this blog know, Free RPG day was a resounding success! The first thing I ran that day was the Pathfinder Beginner Box. A few of us who were trying to find a game early in the day started talking about what we wanted to play. One of the guys milling about had the beginner box tucked under his arm, freshly purchased. He had read it was a good intro to RPGs, and had never played one before. I immediately offered to run it for him, as I had run it in the past, and we quickly gathered a full table. We all had a blast and got through the included adventure in about two hours. Fast forward to yesterday, I stopped in at the Wyvern’s Tale to pick up the monastery flip-mat for the Asheville Pathfinder Lodge meeting this Saturday. I chatted for awhile with Siméon (one of the owners) about upcoming events, and how the lodge is growing exponentially. He let me know that the same guy who had just purchased the beginner box a few weeks ago gathered up a few players looking for a game and GMed it himself! He was getting so in to it, Siméon said he could hear him from downstairs! Hearing this filled my heart with absolute joy. To be able to take a hobby that I enjoy so much, and personally spread the love of the game to others is what its all about. Also in our conversation was an awesome upcoming release that piqued my interest: the Bestiary Box! I’ve never been in to collecting minis, but I do like having a cool representation of both heroes and baddies on the table. The pawns included with the beginner box were a really cool and inexpensive way to make the game come to life. No doubt minis are even better for this, but they’re also pretty expensive and somewhat hard to store if you have a lot of them. Enter the Bestiary Box! For MSRP $35 you get more than 250 different baddies to drop on the table, and the right size bases for large and huge creatures! That’s a steal in my book. Also, lest you think Skyland Games is all Pathfinder all-the-time, I’ve got the DCCRPG adventures on order from the Wyvern’s Tale. I can’t wait to check out what each one holds! I’ve been making enough noises on the blog and at the Lodge meetings to garner some interest in running a table or two of DCCRPG. Once the guys are a little burned out on Pathfinder, we’ll get back to the coolest old-school/new RPG on the block! In other news, the Skulls and Shackles Pirate Campaign is going swimmingly (sometimes literally). We’re about at the end of the Wormwood Mutiny, and I have to say I’m impressed. Our intrepid GM Micheal has put a lot of prep-work in to making it awesome for us, but there are certainly a lot of excellent and varied encounters throughout, without losing that distinctive pirate feel. Nice work Paizo, and thanks to our awesome GM and players! Some of the Skyland Games guys are taking this holiday to get together, grill out, and roll some dice! Hope you get to do the same. Speaking of which, I’ve got some maps to draw. Game on!